Panelists, from left, Imam W. Deen Shareef, Pastor Christa Compton, and Rabbi Jesse Olitzky, consider the religious implications of achieving peace. One way to counter suggestions that violence can be justified in the name of God, he said, is to “open up the big, big books” that each religion uses as a holy text, noting that scriptural references to peace are far more prevalent than those which sanction harm to one’s enemies in the Torah, the Koran, and the Christian Bible. 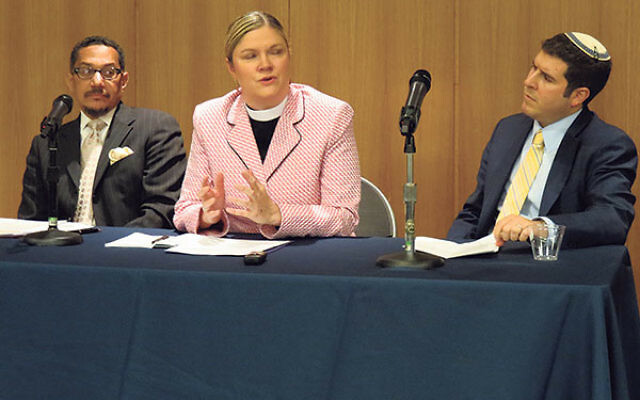 “Í truly believe that much of what we see as violence in our world, much of what we see as the lack of civil discourse we see now, is motivated by fear,” said Pastor Christa Compton of Gloria Dei Lutheran Church in Chatham. But, she said, one of Christianity’s “most difficult teachings is to love our enemies. I take comfort that Jesus said ‘love’ and not ‘like,’” she said, indicating that striving for peace does not have to entail making friends of one’s adversaries. With an ecumenical spirit, Imam W. Deen Shareef of the Masjid Waarith ud Deen mosque in Irvington, listed biblical figures whom Muslims consider prophets: Adam, Noah, Abraham, Moses, Jesus, and Mohammed. “We give a greeting of all the messengers and prophets — Shalom aleichem, Salaam aleikum, Peace be upon you…. It is giving a greeting that is a reminder that we, as human beings, are supposed to be people of peace,” he said. Asked by Golden to name a person who inspired each panelist to work for peace and justice, Compton cited Leymah Gbowee, a Lutheran activist in Liberia who organized Women of Liberia Mass Action for Peace. For her efforts in helping to end to the Second Liberian Civil War in 2003, Gbowee was awarded a Nobel Peace Prize in 2011. Shareef said that during the racial struggles of the 1960s he subscribed to a definition of his religion that came from Nation of Islam leader Elijah Muhammad that embodied the American ideals of freedom, justice, and equality. “For Muslims that was not necessarily the definition of Islam, but for African-American people in the ’60s that was the definition that resonated with us,” said Shareef, an African-American. He said one of his role models was Elijah Muhammad’s son, W. Deen Muhammad, who disbanded the Nation of Islam in 1976 and transformed it into an orthodox mainstream Islamic movement. In doing so he rejected the Nation’s strict advocacy of racial separation and his father’s claim of being a prophet. Shareef also saluted Frederick Douglass, the former slave who became the leader of the abolitionist movement. “He existed at a time when there was practically no peace, not only for black people, but there was no peace for white people, either. He became a spokesperson not only for the freedom for African-American people but he became a spokesperson for the freedom of human beings, period, as a reminder of how a human being is supposed to treat other human beings,” said Shareef. Olitzky praised three fellow rabbis as pursuers of peace. One was Joachim Prinz, who served as religious leader of Temple B’nai Abraham in Newark, then moved with the congregation to Livingston. Prinz, a refugee from Nazi Germany, was an outspoken advocate of the civil rights movement; a close ally of the Rev. Martin Luther King, Prinz introduced the civil rights leader when he delivered his “I Have a Dream” speech at the 1963 March on Washington. Another man Olitzky mentioned was Rabbi Seymour Atlas, who lost his pulpit at the then-Orthodox Agudath Israel Etz Ahayem Synagogue in Montgomery, Ala., after endorsing the African-American boycott of the city’s segregated buses on Rosh Hashana in 1955. Like Prinz, Rabbi Abraham Joshua Heschel, an eminent Conservative educator and theologian, was a close associate of Dr. King’s. Heschel described marching with King against segregation in Selma, Ala., as “‘praying’ with my feet, and that is a part of what our faith tells us to do,” Olitzky said.